The Coastal Streams Basin, located adjacent to south Mississippi’s coast line, drains an area of about 1545 square miles and empties into the Gulf of Mexico. Major water bodies in the basin include the Wolf, Jourdan, Little and Big Biloxi, and Tchoutacabouffa Rivers, as well as the Bays of Biloxi and St. Louis. The Basin also includes the Mississippi Sound and the barrier islands of Cat, Ship, Deer, Horn, Round, and Petis Bois. Each impaired water body will have a report completed for each pollutant causing impairment. Each TMDL report includes the suspected sources of impairment, and predicts a reduction of the pollutant necessary to restore the water body to its intended use. For more information about the TMDL program, please click on the TMDL Quick Link. The Section 303(d) List of Water Bodies lists the impaired segments of specific water bodies, the location and length impaired, the cause of impairment, and the intended use. Surface waters (e.g., streams, rivers, lakes, estuearies, etc) are assigned intended uses. These designations allow regulatory agencies to establish water quality goals, which protect aquatic life and allow safe use by the public. These goals are referred to as Water Quality Standards. 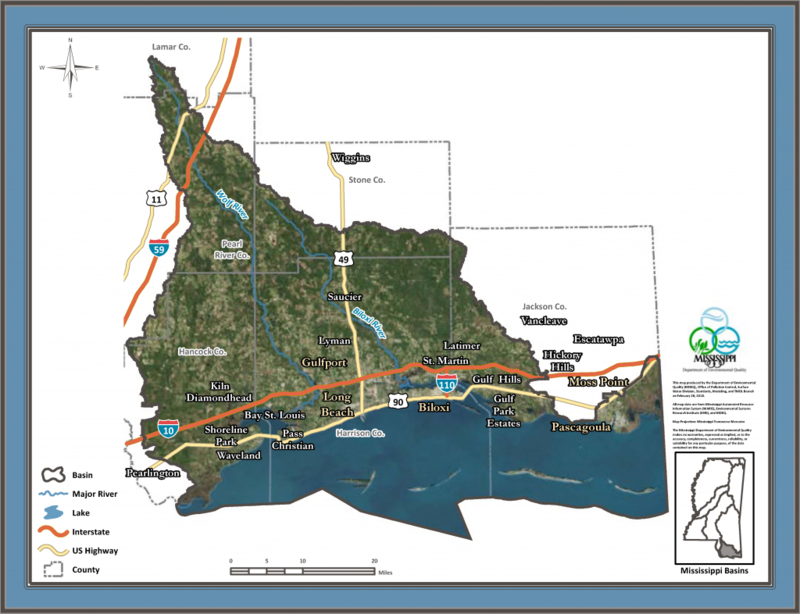 The designations that exist in Mississippi are Public Water Supply, Shellfish Harvesting, Recreation, and Fish and Wildlife (i.e., Aquatic Life Use Support). Click the link below for a map or a list of the designated waters of the Coastal Streams Basin. The Basin Management Approach, TMDLs, Assessments, and Standards Sections are all part of the Surface Water Division of MDEQ. For more information about activities relating to surface water, please visit the link to the Surface Water Division Home Page. For more information, contact Coen Perrott.